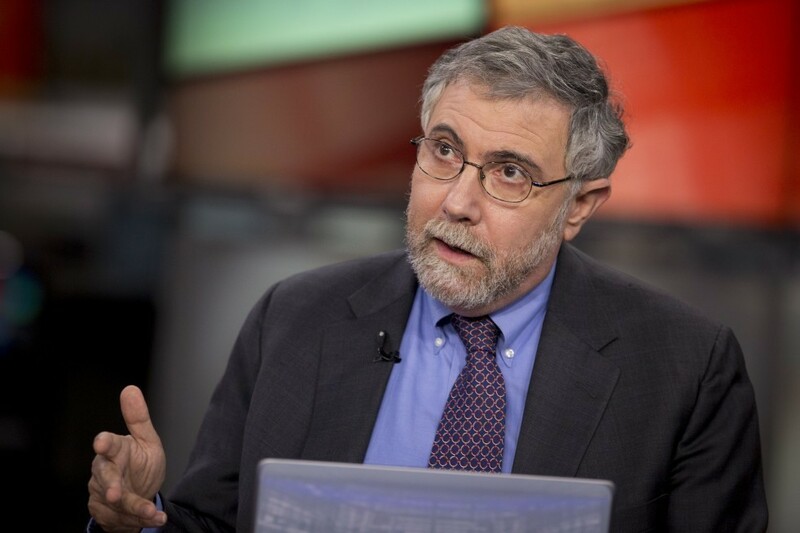 Conservatives think they’ve caught Paul Krugman in an act of hypocrisy. They haven’t. There's nothing more predictable than people being in favor of deficits when their preferred political party is in power, and against them when it's not. Republicans, as you might recall, have spent the past eight years warning that President Obama's deficits would turn us into Greece to the point of actively trying to force us to default on the debt supposedly as a way to keep us from doing so tomorrow, only to turn around and get ready to add $9 trillion of red ink now that they're in charge. Debt hysteria, you see, is reserved for Democratic presidents. It's the same sort of thing conservatives think they've caught Paul Krugman doing. Back in August, when it looked as though Hillary Clinton was going to win the White House, he wrote that it was still “Time to Borrow.” But now that Donald Trump is getting ready for the most elegant, most tremendous inauguration ever, Krugman has said that “Deficits Matter Again.” Now, this might seem like a pretty straightforward gotcha, but only if you don't read past the headlines. There's actually no contradiction here. It comes down to two things: what interest rates are when the government borrows money, and what it borrows the money for. In the first case, when rates are near zero, it almost doesn't matter what Uncle Sam spends on. All that matters is that it does spend. Think about it like this: If businesses won't borrow even when interest rates are zero, then the government can do so without having to worry that it's using money the private sector wants. Bigger deficits, then, wouldn't lead to higher borrowing costs, because the government wouldn't be competing with companies for funds, and the Federal Reserve wouldn't raise rates in the face of a still-weak economy. In fact, as the International Monetary Fund has shown, stimulus actually “crowds in” private investment rather than crowding it out. That is, more government spending means more growth, which, in turn, makes companies want to invest more because things look better than they did before. So it's not much of a stretch to say that any tax cut or spending increase would pass a cost-benefit analysis, since there wouldn't be much of a cost-benefit analysis to be performed. Anything would help the economy, although it's true that some things, like, say, infrastructure spending, would help more than others, like tax cuts for the rich. Which is to say that while we always want to get the biggest bang for our stimulus buck — that way we don't rack up more debt than we have to — any buck is better than none. That, for example, is why the Obama administration agreed to extend the high-end Bush tax cuts back in 2010. As ineffective as that was, it was better than having no effect. When we need it, stimulus is the closest thing there is to a free lunch in economics. Indeed, it's at least a heavily-discounted one that can even pays for itself a little. But what about when interest rates are above zero, like they are today? That's when the usual trade-offs are no longer, well, off. Government borrowing will once again push interest rates up, offsetting the stronger public sector with a weaker private one. Now, that doesn't mean we can't justify any new spending or tax cuts. It just means that we can't justify all of them. Krugman's point, which he's been consistent on, is that the best use of our money right now would be investing in our infrastructure — and that we shouldn't let our debt or the economy approaching something like normalcy stop us from doing so. These are things we're going to have to spend on eventually, so we might as well do so when our borrowing costs are still historically low. That'll save money in the long run. And more to the point, the increased productivity benefits are worth the increased borrowing costs. What isn't, though, is slashing taxes for top-earners at the same time that the top 1 percent's share of the income pie is still historically high. That was barely worth it during the crisis. It isn't now. It isn't hypocritical to point out that borrowing money to invest in infrastructure makes more sense than borrowing money to cut taxes for the rich, especially when borrowing money isn't the reduced-price lunch it was before. Nor is it intellectually dishonest to say that what was good stimulus before is still good policy today. That, after all, is what made it good stimulus in the first place. In the end, though, the only thing more predictable than people changing their minds out of political expediency is accusing other people of doing so.